SSU senior Jenny Campbell had a big game for the Bears with four goals and an assist. SSU senior Maddie Woodard looks to score early in Tuesday’s match. Woodard finished with two goals and three assists. 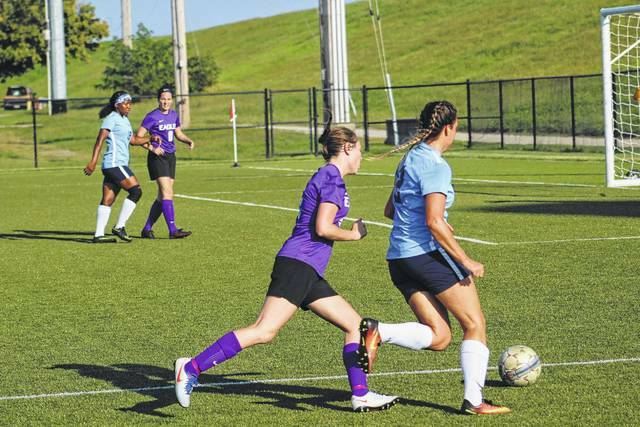 It’s not often that you see soccer games finish with both teams combining for 14 goals, but that was the case Tuesday night at Shawnee Turf when the Cincinnati Christian Eagles (4-3-3) came to Portsmouth to take on the Shawnee State Bears (5-1-1). The Bears were hoping to pick up a win with just one game to go before conference play begins. Thanks to a big game from seniors Jenny Campbell and Maddie Woodard, Shawnee State was able to capture a 9-5 victory over the Eagles. It wasn’t an easy win, though. Cincinnati Christian started the scoring just over two minutes into the game, when Maren Hance found the net off a pass from Megan Klenk to put the Eagles up early, 1-0. Shawnee State, however, was unfazed. The Bears scored two goals in response, with Campbell scoring at the 34:26 mark of the first half and Woodard adding another at the 31:38 point of the period. The Eagles had an answer of their own as Hance scored once again off a pass from Klenk with 31:09 remaining in the first. From there, though, the Bears went on a 3-0 scoring run led by Campbell and Woodward. Campbell scored on a pass from junior Adrianna Johnson at 26:27 to give Shawnee State a 3-2 lead. Just under four minutes later, Woodard found sophomore Destiny Chester for her second goal of the season. Then, with 20:53 to go, Campbell again scored on a pass from Woodard to put the Bears up 5-2 and give Campbell a hat trick. “We were super happy to have Jenny Campbell back. 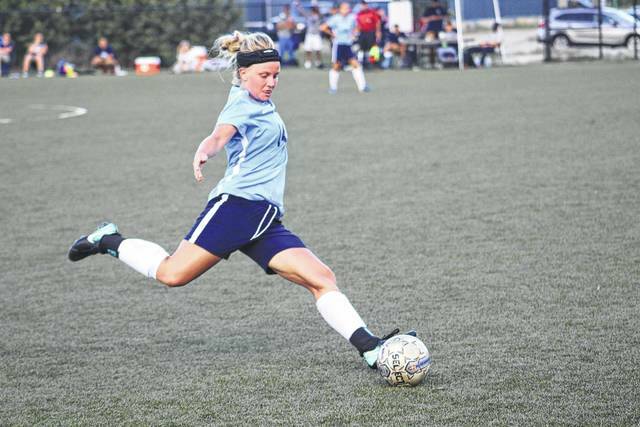 She was able to move the ball for a lot of the other girls for us to have such a successful win and for us to have a solid nine goals,” Shawnee State head coach Aubrey Sherman said. It was the first game Campbell had played in 11 days, since the Bears played Asbury on Sept. 8. Campbell was able to provide a spark for Shawnee State early on and throughout the game, according to her head coach. With just 13:22 left in the first half, the Eagles drew closer with an Erin Sweeney goal on a dish from Stephanie Reece. At halftime, Shawnee State claimed a 5-3 lead over Cincinnati Christian. The scoring didn’t stop in the second half, either. Shawnee State got a boost from several local athletes, first from Greenup County graduate and sophomore Olivia Ball, when she found Woodard on a cross to put Shawnee State in front 6-3 at the 37:42 timeframe of the second half. Woodard then found Campbell again for her fourth goal of the day, which gave the Bears a 7-3 advantage just over five minutes after Woodard’s goal. Sherman liked what she saw during the match from Woodard, who was like a point guard on the turf for the Bears. “She controls the ball very well, and she does a good job at holding the ball so she is able to get some of our offense up and to distribute the ball to them,” Sherman said about her forward. Cincinnati Christian was able to add two more late goals to make the score more respectable, but Shawnee State wasn’t done offensively either. Freshman midfielder and Portsmouth West graduate Emily Taylor found freshman forward Madison Patrick with under ten minutes to play to add to the lead. Then, just over a minute later, Taylor scored her first goal of the season. When it was all said and done, Shawnee State won by a final score of 9-5 in what was a shootout between both schools. Shawnee State (5-1-1) will hit the road to face Ohio Christian University (2-2) in Circleville on Thursday evening. https://www.portsmouth-dailytimes.com/wp-content/uploads/sites/28/2017/09/web1_rsz_campbellone.jpgSSU senior Jenny Campbell had a big game for the Bears with four goals and an assist. https://www.portsmouth-dailytimes.com/wp-content/uploads/sites/28/2017/09/web1_rsz_woodardtwo.jpgSSU senior Maddie Woodard looks to score early in Tuesday’s match. Woodard finished with two goals and three assists.